ST. GEORGE — Americans awoke Saturday to learn that quarreling politicians in Washington had failed to keep their government in business, halting all but the most essential operations and marring the anniversary of President Donald Trump’s inauguration. National parks in Utah are among those affected by the shutdown, remaining open but with bare-bones staffing. 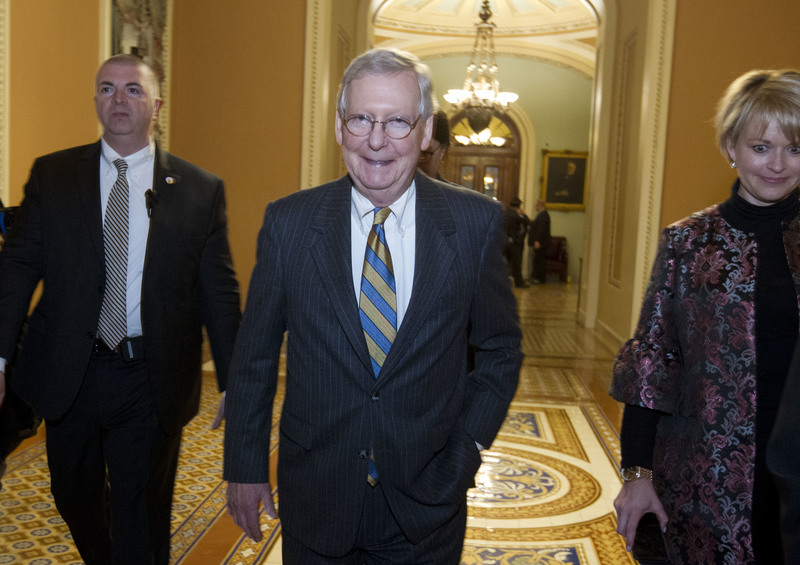 After hours of closed-door meetings and phone calls, the Senate scheduled its late Friday night vote, which failed, on a House of Representatives plan to fund the government through mid-February that had passed Thursday, 230 to 197. In the Senate Friday night, the plan gained 50 votes to proceed but suffered with 49 against it. Sixty votes were needed to break a Democratic filibuster. Democrats balked in an effort to put pressure on the White House to cut a deal to protect immigrants brought to the country as children and now here illegally — commonly called “Dreamers” — before their legal protection runs out in March. The result is the fourth government shutdown in a quarter-century. 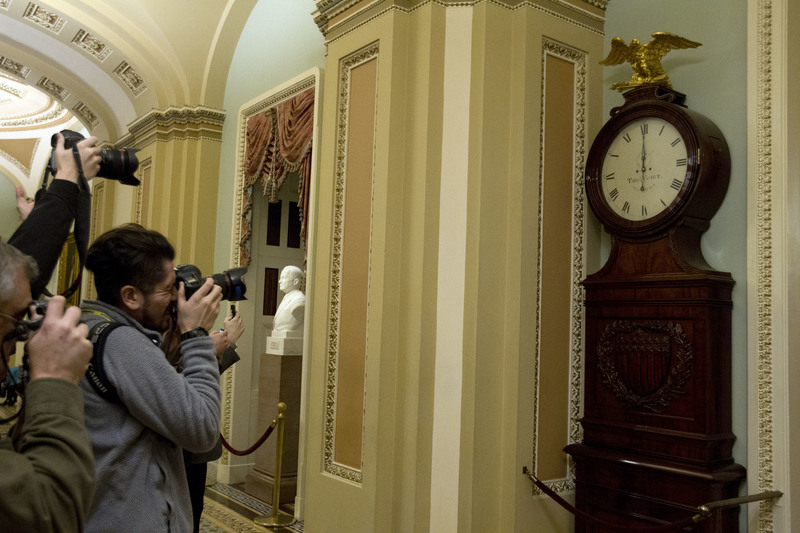 It began at the stroke of midnight Friday, shortly after Senate Democrats blocked a four-week budget extension and a flurry of last-minute negotiations could not beat the clock. It was a striking display of Washington dysfunction, and the finger-pointing came quickly. It comes with no shortage of embarrassment for Trump and political risk for both parties, as they wager that voters will punish the other at the ballot box in November. Trump tweeted that Democrats “wanted to give me a nice present” to mark the start of his second year in office. Utah Sen. Orrin Hatch released his statement Friday night asking for compromise on both sides. The closure began at the start of a weekend, so many of the immediate effects will be muted for most Americans. Damage could build quickly if the closure is prolonged. Among those affected by the shutdown are the country’s national parks, monuments, recreation areas and historic places. 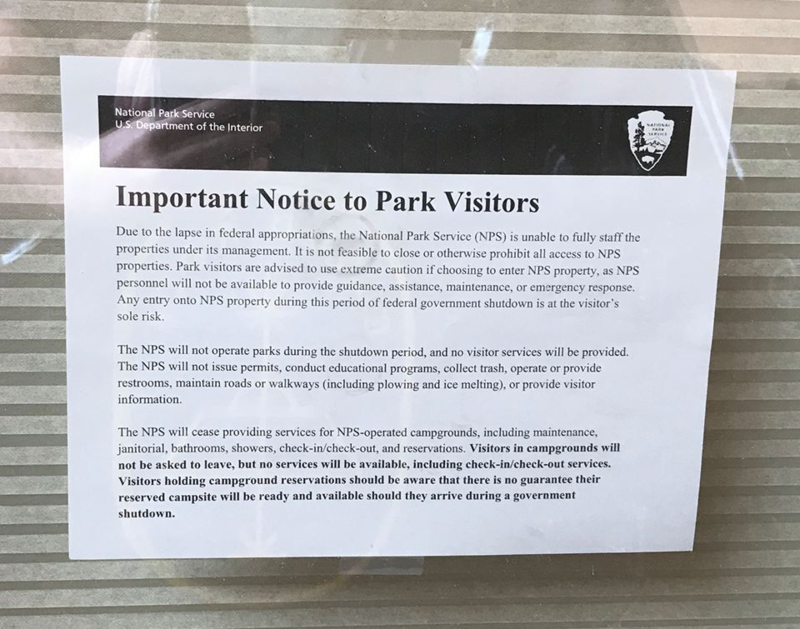 Parks must notify visitors that the NPS will cease providing visitor services, including restrooms, trash collection, facilities and roads maintenance (including plowing), campground reservation and check-in/check-out services, backcountry and other permits, and public information. National and regional offices and support centers will be closed and secured, except where they are needed to support excepted personnel. Utah officials have said the state’s five national parks will still be accessible but with bare-bones staffing. Utah Office of Tourism managing director Vicki Varela said her office and the superintendents of Utah’s parks discussed contingency plans Friday afternoon and expect parks to be open but with minimal services. Services like visitors centers and trash collection will be curtailed, snowplowing will be limited and no park rangers will be on duty. Visitors should exercise caution, Varela said, and those who experience an emergency will be best served by finding cellphone service and calling 911 rather than looking for a ranger to help. Entry gates will be left open but stations nearby where park rangers typically collect park entry fees will be unstaffed. Fees will not be charged for entrance. Nate Wells, general manager of Zion Canyon Village, said in a text message that access throughout Zion National Park will be limited, but state Route 9 will remain open. In the event of a federal government shutdown the State of Utah’s operations will continue as normal. State support will allow programs that operate in partnership with the federal government to function in the short term, even if federal funding is temporarily curtailed. In contrast to Utah’s most recent experience with a federal government shutdown, this administration is working responsively with Utah to minimize local impacts. For example, in the last government shutdown the Special Supplemental Nutrition Program for Women, Infants, and Children, known as WIC, was not authorized to spend any reserves and had to shut down. This administration would allow the State of Utah to use reserves to keep WIC functioning. Additionally, we have every reason to believe that Utah’s National Parks will remain open, albeit with limited services. As in the past, the state of Utah would consider providing emergency funding to maintain appropriate access and safety in the National Parks throughout the duration of a shutdown. Should there be any disruption accessing federal recreational opportunities in Utah, we remind visitors that Utah’s 43 state parks also offer incomparable outdoor experiences. More information about what visitors to Utah could expect in the case of a shutdown can be found at visitutah.com/shutdown. Concern by interest groups was expressed about the reduced staff and conservation efforts in the national parks. Herbert also noted in his statement Friday afternoon that the largest state organization in Utah most directly affected by a government shutdown would be the Utah National Guard. The Republican-controlled Congress scheduled an unusual weekend session to begin considering a three-week version of a short-term spending measure and to broadcast to the people they serve that they were at work as the closure commenced. It seemed likely that each side would push for votes aimed at making the other party look culpable for shuttering federal agencies. Trump spoke with Senate Majority Leader Mitch McConnell early Saturday to discuss next steps, while chief of staff John Kelly also worked the phones. Top White House negotiators, legislative affairs director Marc Short and budget director Mick Mulvaney, went to Capitol Hill to meet with House Republicans. Democrats say they oppose the three-week plan, which they view as a way to stall negotiations over the future of the “Dreamers” — the young immigrants brought to the U.S. as children and facing possible deportation when their protection expires in March. Republicans declared they would not reopen talks until the government shutdown ends, a strategy aimed at trying to erode Democratic cohesion. “Negotiations will not go on until we open the government up and start being serious about the fundamental issue that is before us all,” Rep. Mark Meadows, a conservative leader, said Saturday. Social Security and most other safety-net programs are unaffected by the lapse in federal spending authority. Critical government functions will continue, with uniformed service members, health inspectors and law enforcement officers set to work without pay. But if no deal is brokered before Monday, hundreds of thousands of federal employees will be furloughed. Republicans branded the confrontation a “Schumer shutdown,” after New York’s Chuck Schumer, the Democratic leader. He said a “Trump shutdown” was more accurate. Arguing that Trump’s predecessors “weaponized” that shutdown, Mulvaney said his budget office would direct agencies to work to mitigate the impact this time. That position is a striking role reversal for the conservative former congressman who was one of the architects of the 2013 shutdown. St. George News Editor in Chief Joyce Kuzmanic contributed to this report. The Associated Press writers ZEKE MILLER, ANDREW TAYLOR and ALAN FRAM contributed to this report, with additional contributions from AP writers Jill Colvin, Richard Lardner, Matthew Daly and Catherine Lucey in Washington and Jonathan Lemire in New York. and copyright 2018 The Associated Press as to AP contributing AP content. All rights reserved. This material may not be published, broadcast, rewritten or redistributed. This shutdown could be short-lived. I can only wonder how the fact checking contingent is scoring the rhetoric from all sides in the matter. We seemed to have narrowed down the immigration debate to settling the DACA issue, which appears to be broadly supported (nationally, if not specifically here in Utah). The manufactured drama, and inefficiencies, reflect a dysfunctional Republican Administration. The political landscape may improve modestly in January 2019, but real changes won’t happen until January 2021. I suppose, it depends on what side of the coin your looking at. Democrats won’t make deal for the dada kids. You can’t have it all one way. That’s not a deal, that’s communism. It’s democrats fault. They care more about illegals than American citizens. Democrat or Republican. It’s been that way for the last 25 years (that I’ve been aware of it). Its gotta stop sometime, make legal Americans first. Please explain to me, then, why Republicans allowed CHIP to expire more than 100 days ago if they have the corner on the “make legal Americans first” market? I didn’t mention anything about CHIP, sidewinder. Would you like to comment on what I did say? Its related given your overzealously comment about who cares about American citizens. The Republicans let CHIP expire in December and are now using it as leverage. Here is the thing…I know its a big step for partisans but…most Representatives care about American citizens. They may differ on policy but I’ve never met a Congressman that didn’t care about their constituents. Its extremism to assume one party owns patriotism and compassion. I’ve met about a dozen. All of them cared, no matter their party. No clue what the sidewinder reference is about. Sidewinder: An appearance to care. I met the congresswoman, she even gave us gift cards for Christmas (caring) but when it came down to the actual crimes being committed and retaliation, by la county officials, against my family for speaking up against the wrongs….thats when she turned a blind eye. Citing there are laws in place. And that’s the point, these officials are “above the law” and getting away with it. The 3rd time to FBI they suggested we move, we did within a few months. In the end, many years later, sheriff lee Baca being convicted is a little satisfaction, since la county sherriffs were involved. I’m sure your congressman care but what does caring do? Absolutely nothing. What do they care about? Getting reelected. Four major Republicans voted no. Heavy hitters. The simplistic narrative both sides are fostering doesn’t hold up to scrutiny. Government shutdowns actually cost us more than standard operations after all is said and done. Its not good for anyone. And no, its not treason, which has an explanation definition. DACA is illegal and is not a part of the spending bill, what part of that do you numb skulls do you not understand ? The dems are at fault and they own this foolish shutdown, the crybaby liars that they are.. The Deferred Action for Childhood Arrivals program, DACA, came into being on the wings of an unconstitutional act. That’s the core theme here — not that President Donald Trump is cruel, not that law-and-order Republicans are heartless, not even that poor innocent families may be torn apart and sent their separate ways. Barack Obama brought the amnesty provision into being in 2012, by unilateral action, after he couldn’t get his way in Congress. Here’s your explicit definition..look it up yourself know it all ! Almost as many Democrats voted for the CR as Republicans that voted against it. Its unpopular, I know, but the Congress and President in totality that own the shutdown. Same as in 2013. Its their disfunction that has caused this mess. For decades now the executive and Congress have slowly moved away from historical procedure and taken the budget hostage over ideological differences. The blame never falls squarely at the feet of one individual or Party. While partisans bicker over blame real Americans are hurting. Maybe be if citizens encouraged bipartisanship and flexibility in their candidates we wouldn’t be do far down this rabbit hole. The Democrats refused to fund the government without an agreement on protections for hundreds of thousands of “unlawful immigrants” living in the United States. The Republicans want to fund the government and work out a more comprehensive immigration deal that includes funding for a wall, eliminating chain migration and the visa lottery system. Republicans tried to make a funding deal more attractive by offering Democrats a long-term extension of the Children’s Health Insurance Program (CHIP), as well as delays for the more unpopular Obamacare taxes. tcrider, go eat a few more tide pods…Get the training wheels off yet? Imagine that, both sides think the other is to blame. The cycle continues. I’ll help you out. The AP reports news, which includes quotes from relevant figures. The quote you used is from the RNC, a partisan leader responsible to the RNC and its brand. Her quote doesn’t make it true, even if its truly what she believes. Pretty simple critical thinking and media literacy. Republicans just needed to hold their own members in line, and the government stays open. Anyone who blames the minority party in this instance is clearly stupid and doesn’t understand what is going on. I thought they needed some Democratic support even if Republicans voted in unison, which they didn’t. This is the first shutdown with a “unified” federal government but that doesn’t leave Democrates completely blameless. Both sides are playing a strategy that led to this outcome. banal and feckless. It’s treally funny that you just can’t accept the reality that you are WRONG AGAIN! Democrats will pay at polls for shutting down the government. The majority of Americans believe keeping the government running is more important than finding a DACA solution, according to a new CNN poll. Democrats in Congress, especially Senate Democrats in red states, will be held accountable during this year’s midterm elections. Millions of Americans have watched Democrats resist and obstruct President Trump at every move, refusing to work with Republicans to find real solutions for the country. Millions of Americans are watching them put politics above people, time and again, and they will be watching Congress this weekend to see what their elected officials do to mitigate a wholly unnecessary crisis. For the Democrats who choose once again to jeopardize government funding, November is going to be a wake-up call. shove that in your fish and smoke it..FACTS , I know that that you hate factual things. But you are biking on the wrong path again !hahahahahahahahahahaha! What are you even talking about? Your entire rant there would undermine the basis of your claim that the shutdown is the democrats fault. My comment to Chris highlights the truth that Republicans couldn’t pass the bill without Democratic support. Never made remarks about who is going to win elections this autumn. Midterm wind are predictions at this point, ie definitely not facts. You are behaving even odder than normal, John. banal and feckless, quit deflecting..you chicken guano brained libtard.you just can’t face FACTS..this is where the dumbocrats are going to own this shutdown..it’s a BIG FACT>>Democrats in Congress, especially Senate Democrats in red states, will be held accountable during this year’s midterm elections. You are obviously wasting your time if you can predict the future. How many times have you won the lottery? I’m worried about your health if its common practice for you shove stuff up fish. I just don’t think that is sanitary. I agree with Stewart. We need to end this Continuing Resolution nonsense. Since 1996 we’ve been addicted to CRs and made appropriation bills almost a thing of the past. Why can’t our federal government create a real budget anymore? Keep the government shutdown. They will all get their money, eventually. You’re hurting the military and their families, American citizens. For what? Illegals. What a shame. How many DACA kids 800,000, that’s nothing compared to the millions and millions of illegals. Did you know that there are illegals that haves there own business here in oklahoma? There’s more than I would think. I see them where I work. I don’t know how that works, I dont know if they pay taxes, have legit social security numbers, or if everyone just turns a blind eye. Was it obama allowing this? Is it policy and grants to benefit illegals? Nooooooooo, this isn’t right. This is a land of laws, albeit, the people enforcing laws are corrupt. We dont need more laws. We need to enforce the ones we have. I bet the Native Americans are laughing at this circus. Amid all the misconceptions, military will NOT be shut down, nor federal law enforcement, nor social security, nor medicare, amid all the finger pointing with democrats trying to blame republicans, and republicans trying to blame democrats, there is one certain thing here. THE PEOPLE WE HAVE PUT IN OFFICE ARE NOT DOING THEIR JOBS, AND HAVEN’T FOR MANY YEARS. All these people are doing, is stroking their egos, banking lots of $$ and living the good life. The senate and house should all be removed from office. It is so obvious that these jackals have totally abandon even a pretense at representing the american people. Further more, the choices we had to make for president were abysmal. Both the parties need to be dissolved, and the party leaders appropriately dealt with. Bam! DRT is exactly right. Yeah, there is alot of misconception about who is furloughed during this and you highlight alot of truth. I don’t agree on cleaning house the way you describe but I do think citizens need to hold their Congressman and President accountable now and during elections. We cam have different opinions on budgets but we need real appropriation bills for the federal government to function. But Congress and the President have all become complacent with holding the budget hostage over ideological battles. I’m not a politician. I coulld have cared less who’s president, never cared, they are all corrupt…..until Hillary came along and I took a stand to stop her….yay! My vote counted…. Trump isn’t doing bad either. I’m for the wall. But even without it, they aren’t coming in as fast as they were, from what i can tell. If there was a different Republican running. I wouldn’t have voted at all…..I love Trump! Trump for 8 years! Nonsense. Its not hate to challenge ideas, especially those radically inconsistent with the Christian values you voluntarily admit to on the regular, shared on a public forum. I didn’t say you are hating on me, or anyone on here is hating on me. It’s my offense, before any hate comes lol….I don’t think any of you are hating on anyone. I never really fully understand your challenges. You jump from one side to another, there is a danger to standing in the middle. Pick a side. I’m not for abortion (murder) I’m not for gay marriage (it’s just gross). I’m not against someone making the choice. I don’t really care what others do as a whole. What I have seen in my personal life since Trump is president is an increase in capital gain on my 401k. What would I like to see? Medical cost go down and lower medical insurance premiums. Would you agree $10 for one Tylenol given in a hospital a bit too high? And the wall. I really want the wall. Then we can make a deal on the people already here. But you can’t make them legal without trying to stop the masses from coming illegally. Would you agree? If you just give legalization without control over the border, would you agree that that would cause an influx of people coming here illegally and we would be in the same or worse position we are already in? The middle is a broad swath of political reality in the US. Its not a simple black and white choice between two parties no matter how much they try recruit with that logic. My thoughts on the border wall aren’t relevant to an article about a government shutdown. Plus, their nuance and lack of partisan commitment are just likely to confuse you more. If the Dems want to force DACA into the budget negotiations (the CR), then they need to be willing to deal. President Trump wants the wall, increased border security an end to chain migration and the lottery system. Give President Trump what he wants and he’ll make a deal on DACA. That said, we need to be very specific in any deal, that it’s limited to 800,000. Unfortunately, the number is likely closer to 3 million. Whatever the number agreed to, it should be counted towards our annual 1 million allocation, which unfortunately would force those going through the “legal” process to wait longer. And remember there are certain requirements for being considered DACA, including speaking English. There is nothing in the DACA qualifications that requires English speaking. That said, one of the selling points is that most who apply are fluent in the language. Most that apply do not speak English. I wish that it was so, but it isn’t. 58% do, 42% do not. Of them all, 68% of their parents do not speak English. In California, all government documents need to be in English & Spanish. DMV’s employee’s are 53% bilingual. When in public, most Hispanics speak Spanish as that is their primary language that they do no wish to lose knowing how to speak it. To clarify, 58% qualifies as most. The documentation I have read, from non-partisan analysis shows that the eligible applicants have greater language proficiency which many consider to be why they have higher labor force participation. That said, the numbers aren’t as glamorous as the left tries to claim. Watch out for the very long one-way construction area in Springdale. Sometimes cars in town will drive in the wrong direction against traffic. Enjoy the parks, and take care of them until the park employees are back. At some point laws have to be enforced. All these DACA kids are mexican nationals and they maybe should be shipped out? When do we start to enforce the laws? And I hear that some of them have joined the military? how the h— do you join the military w/o a valid SSN and w/o citizenship? The same way they get grants and own businesses. When you figure it out, let me know. Sidewinder is a snake. Snakes slithers. I used the word sidewinder to reference not answering or commenting on my comment but instead, creating a different subject usually by pointing a finger and using the words but what about you or what about this or that…..and never addressing the question or comment to avoid answering for anything…..
Teenagers are experts at this. Teenagers grow up to be adults that continue to do this and call themselves bikeandfish and Hunter. Its a cute retort but hollow. When you make a public statement like you did its fair to criticize its consistency, or lack thereof. When you make flippant remarks about one party caring about American citizens its completely logical and fair to highlight the holes in that claim, hence the reference to CHIP. Your unwillingness or inability to support your claim is a statement of your logical flaws, not someones slithering attributes. Your response is an example of what people call “post-truth” reality, its not a compliment despite your untenable claims about facts you’ve made in the past. Its interesting that long respected Republicans aren’t even placing blame solely on Democrats. Its almost like there is enough blame to go all around. It’s highly unusual for a party not to have a unified response if they all actually agreed on the deal; clearly they don’t.